After declaring Part 2 of the Leveson Inquiry to be unnecessary, and thus ensuring his continuing favourable treatment from the Press Establishment, culture secretary Matt Hancock moved swiftly on to set up a different and much more wonderful, honest, Inquiry. So it was that Press Gazette proclaimed “The Government’s review into the sustainability of high-quality journalism in the UK will be led by Dame Frances Cairncross alongside an advisory panel of current and former editors”. Er, what? “High-quality journalism”? When did that happen? I must have blinked and missed it. Most of what masquerades as headline journalism coming out of our free and fearless press nowadays is only “high-quality” because the overall standard is so abysmally low. Note also that there is no discussion of all the lawbreaking and invasive behaviour. All of that is, by default, swept under the carpet. Worse, this whole charade is pointless. We can see this by inspecting the panel which will “explore what intervention might be required to safeguard the future of our free and independent press”, as Hancock put it - starting with its chair. Frances Cairncross “was senior editor at The Economist, from 1984 to 2004, and formerly a principal economic columnist for the Guardian”. That means she is very much Old Media. And the rest of the panel is stacked that way, too. These are the great and good who will assist the Old Media chair. 9 Mimi Turner, founder of brand strategy consultancy Mimi Turner Associates who has been “instrumental” in growing UK media brands including Lad Bible and Vice Media. Spent three years working for Richard Desmond as group director of communications at Express Newspapers. 11 Peter Wright, editor emeritus at Daily Mail publisher Associated Newspapers and former editor of the Mail on Sunday (1998-2012). So let’s pick the bones out of that lot. One, the KM Group (KM stands for Kent Messenger) is Old Media. 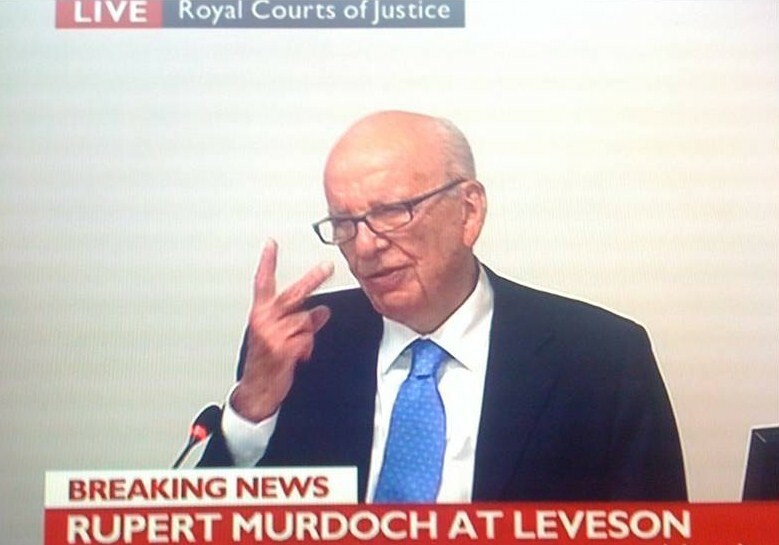 Two, Johnston Press is Old Media. 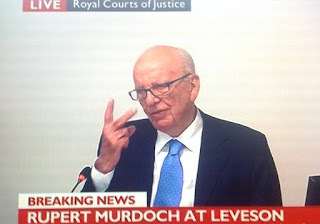 Three, Guardian Media Group is Old Media. Four, ex Express Newspapers is Old Media. Five, the Advertising Association is Old Media. And Six, Associated Newspapers is most definitely Old Media. With the Inquiry’s chair leaning towards Old Media, what does that give us? Hey, it’s a majority! Who knew? Worse still is the presence at the foot of that list, put there to suggest he was an afterthought, which he most certainly wasn’t, of one Peter Wright. I will leave it to Dan Waddell, who knows the industry well, to say a few words about Wright, his back story, and his potentially highly malign influence on the Cairncross Inquiry. He has not held back. 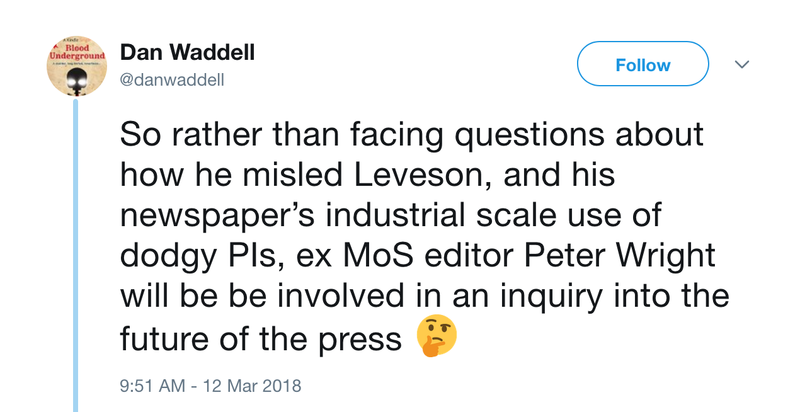 “So rather than facing questions about how he misled Leveson, and his newspaper’s industrial scale use of dodgy PIs, ex MoS editor Peter Wright will be be involved in an inquiry into the future of the press … Matt Hancock cancelled Lev 2 to concentrate on the future of the press, and has asked a tainted dinosaur, who would have been grilled within an inch of his life, to sit on it. That stinks”. Wright lied to the Leveson Inquiry, and provably so. He withheld evidence from the PCC’s inquiry into phone hacking at the late and not at all lamented Screws (he refuted the claim, but there was not even a hint that he might take action over it). And there is more. “Wright knew about the extent of phone hacking yet allowed the News of the World to peddle the ‘One Rogue Reporter’ lie for years. 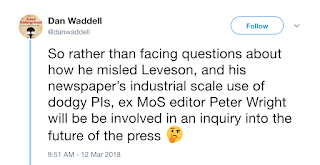 Something else he would have been grilled about at Lev 2 … ‘The inquiry will look into protecting he sustaining high quality journalism.’ And will include a man who presided over a newspaper that commissioned illegal activity on a vast scale”. Remember the Mail titles and Steve Whittamore? 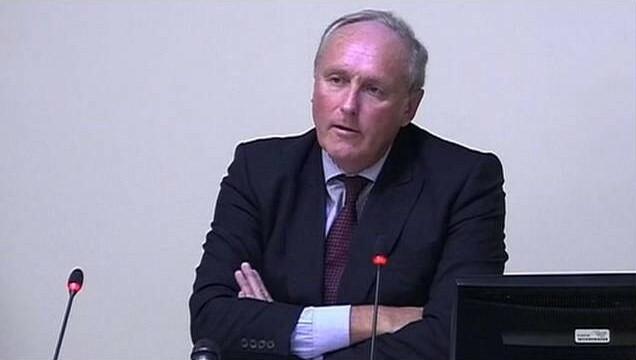 Matt Hancock has pontificated “I tremble at the thought of a media regulated by the state at a time of malevolent forces in politics. Get this wrong and I fear for the future of our liberal democracy. We must get this right … Our job in government is to provide the framework for a market that works without state regulations of the press”, but no-one has proposed state regulation of the press. It is a figment of the Old Media mindset. What he really means is that he is reading from a script provided for him by that same Old Media Establishment on which Theresa May has bet the house. The Tories are desperate to make it look like they are doing something; what Hancock has announced shows the limits of what the Old Media will allow. They set the rules, their people pack the panel. Meanwhile, the victims of press misbehaviour get nothing, with the newly minted excuse that the brave new press world is now moving on, looking only forward, on its way to a bright and optimistic new world of irrelevance and oblivion. The Tories have removed all doubt around the press by not only doing their bidding, but gifting them a sham inquiry with the deck stacked to fiddle the result. Any thought that they might do the right thing has been completely dispelled by Hancock’s actions. A free but accountable press is still the only way forward. That is all. "Matt Hancock has pontificated “I tremble at the thought of a government regulated by the media at a time of malevolent forces in journalism. "" Hancock, of course, is doing nothing. He's a zero hours messenger boy with a yellow streak a metre wide running down his back. A tory as morally corrupt and hypocritical as the rest of them. I'd love to see the prick answering questions face to face with the victims of Orgreave or the families of Hillsborough or the vilified mining communities. He'd empty his bowels inside the first minute. 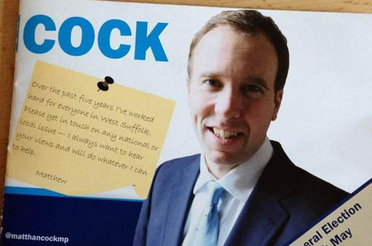 He's a typical byproduct of the dry rot infesting Westminster, Whitehall and Canary Wharf. A horrible sociopath with bad intentions, eyes like a shithouse rat.